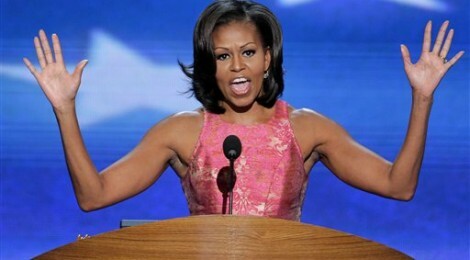 Last night, First Lady Michelle Obama gave a rousing speech at the Democratic National Convention. She seemed to leave no stone unturned, providing what pundits are calling “humanizing” details about her husband. However, in addition to taking a moment to dwell on the spellbinding nail polish FLOTUS was sporting (it was a lovely blue- grey, which we will be attempting to purchase later), we would like to highlight some problematic aspects of the evenings’ affairs. The First Lady’s speech focused on Whitney Houston-esque “I believe the children are our future” rhetoric, which we have seen and heard so many times before, but in this particularly disturbing economic climate, her words (and the words of San Antonio Mayor Julian Castro who spoke before her) were earth-shatteringly depressing. Both Castro and Obama spoke of the sacrifices their parents and grandparents had made in order to create a better life for them. Castro talked about how his grandmother, an immigrant, worked all sorts of odd jobs so that his mother could get an education, and how his mother had made sacrifices that had afforded him the opportunities he had in life. My grandmother’s generation and generations before always saw beyond the horizons of their own lives and their own circumstances, Castro said. “And that’s the middle class—the engine of our economic growth. With hard work, everybody ought to be able to get there. And with hard work, everybody ought to be able to stay there—and go beyond. What about those of us who are not doing as well as our grandparents? Should we blame ourselves? It was as if Castro was saying that we should have modest dreams now, and have babies (sons?) who might someday be lucky enough to have a future. But how are we going to afford those adorable babies, and what if (God forbid) we don’t want to have them? It was as if he was saying that people who are dissatisfied with and focused on their current situations are just being short-sighted. And she would often tell Barack, “So long as you kids do well, Bar, that’s all that really matters. No. What matters is that you, grandma, are being discriminated against! How can you teach your grandchildren to stand up for injustice if you don’t take up the fight? In both of these instances, stories centered around women sacrificing all they had so that their children could succeed. Mrs. Obama consistently identified herself as a “Mom,” which is all well and good, but quite frankly, this type of self-sacrificing motherhood being celebrated as the norm is extremely problematic. It might be argued that Mrs. Obama herself has sacrificed (or rather altered) her own ambitions so that her husband could live out his dream. Granted, many women would happily quit jobs to be FLOTUS, still, seeing ones own identity defined by her husband’s job may give even the most liberated woman pause. Of course the story about Barack’s grandmother was used to illustrate how personally important the Lilly Ledbetter Fair Pay Act was to the President. Some day, the little boy raised by his grandmother will grow up to save womankind! In other problematic ideas, Mrs. Obama shared some of the things she and her husband had learned. “We learned about dignity and decency, that how hard you work matters more than how much you make…That the truth matters, that you don’t take shortcuts or play by your own set of rules. It’s as if she was trying to slip some things by us! Dignity: awesome, decency, yes, “that how hard you work matters more than how much you make” wait, what? Tell that to unpaid interns. Tell that to minimum wage workers who earn $7.25 per hour in New York City. Tell that to the unemployed who have full-time jobs looking for work! Then, she reels us back in again with “Truth matters,” yes, something we all agree on. “You don’t take shortcuts or play by your own set of rules,” she slips in. We should totally play by the rules we have right now, because they are obviously working so well and so fast!